Law firm billable hours, revenue, and profits are projected to remain under pressure this year, according to a 2013 Client Advisory recently published by Hildebrandt Consulting and Citi. The litigation and corporate sectors of the legal market, which together represent over 50% of the total legal spend, saw either flat (litigation) or nominal growth of 1% (corporate) in 2012 over 2011. Employment law is a bright spot, with a 4% growth rate in 2012. As corporations rush to meet the requirements of the Affordable Care Act, employment law guidance on matters such as the use of independent contractors and full-time versus part-time status will likely be in continued demand. Bankruptcy, real estate, IP litigation, and tax law services declined in 2012, according to the report. The drop in real estate and bankruptcy law may parallel modest economic improvement in the economy at large, which in a countercyclical way is a positive trend overall. 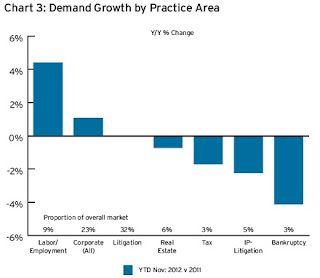 Below is a chart that summarizes legal market practice area performance.